Stylish magnetic name badges with self-adhesive backs are perfect for almost every occasion from exhibitions and conferences to corporate events and parties. Our magnetic name badges are constructed using two high performance neodymium magnets and offer ultimate attraction through almost all types of clothing. Each magnet is supplied with a super strong adhesive backing meaning you can create and customise your very own badge shapes and sizes to attach directly to the magnetic badge. Use our simple badge templates to start making your own name badge designs. We have picked three of the most popular badge sizes and presented them in PDF and Microsoft Word format to help you get started. Please feel free to download and store these. Have you have turned up to work or arrived at a wedding in a brand new suit or shirt to then be asked to wear a name badge? The name badge often includes a small pin that pokes directly through your clothing. Despite leaving a small hole in your new clothes you also run the risk of going a little too far with the pin! That is very painful. Magnetic name badges are a great way to protect your clothing and hold name badges securely in place. Each name badge is supplied with two metal plates. One of these two plates has two high performance neodymium magnets attached to it and the other a super strong self-adhesive foam pad. The adhesive is perfect for attaching your own name badge design. 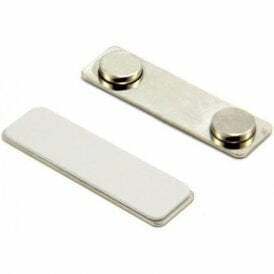 Simply place the name badge plate on the outside of your clothing and the plate with the two neodymium magnets under your top or inside your jacket. 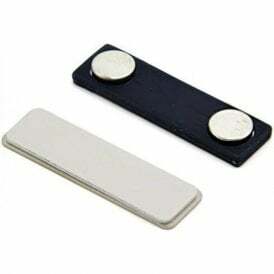 The two plates will attract to each other and create a fantastically strong magnetic name badge.